Ideal for storage under bed. Special Heavyduty gas springs available in two loads. 30° opening angle allows easy access. Easy to lift (with the weight of top board) with minimum force. Easy access as the gas lift keeps the bed top stay. 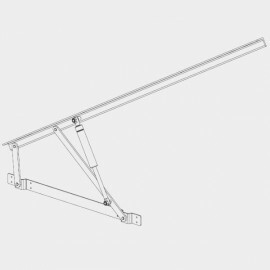 Long brackets provided for better support to the bed platform. Fit the fix bracket on bed frame as per given dimensions. (Refer Fig.1). without the gas spring fitted. 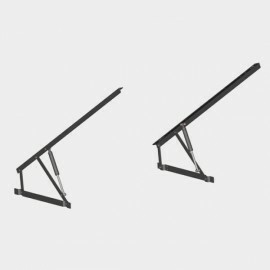 Now fix the bed platform to the top brackets (Refer Fig. 2). Lastly fit the gas springs as shown in diagram (Refer Fig.3). Installation dimensions are only recommendation and will vary depending on type of construction design. Gas springs used are highly pressured, do not dismantle or damage and do not expose to heat or fire. Ensure that the top bed is locked properly with the bed frame. Do not tighten nut fully, Gas springs should be able to rotate.